I had this photo in my archives, and it was just too pretty not to use. So today I’ll be talking about “pink snow.” The photo shows the New River Mountains, about 10 miles northeast of my home, at an elevation of 5000 feet. Virtually every winter, they get a few nice dustings of snow (the white kind). This shot is from February of 2010. 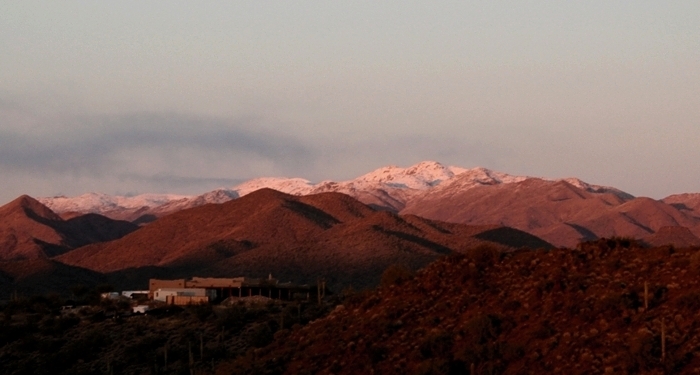 The snow looks pink because the photo was taken just before sunset, and the ambient light had a distinct reddish tinge. 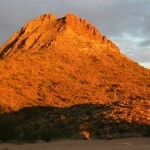 We often see the same effect on Gavilan Peak, a mountain just east of here. 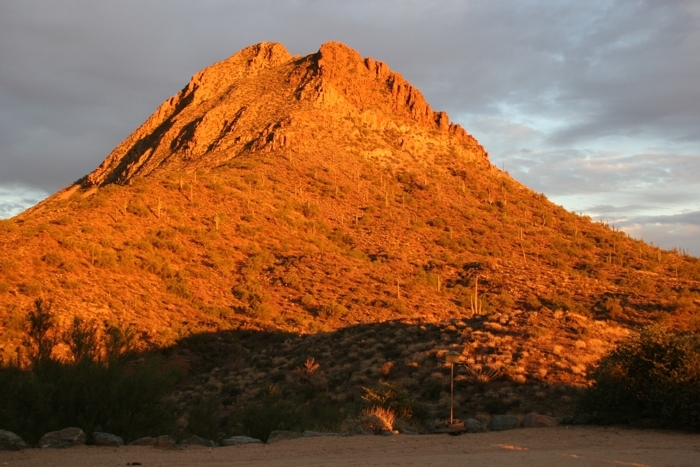 The mountain is covered with the usual greenish-brown desert foliage, but note how everything has a distinct reddish hue. This photo was also taken at sunset. Click on the thumbnail to enlarge. The basic idea is that light from the Sun normally contains all colors, so landscapes normally appear in their “true” hues. But at sunset, when the shorter wavelengths of light (violet, blue, and green) are filtered out by Earth’s atmosphere, you can get some interesting and beautiful effects. If you’re curious about why sunsets are red, click here. Of course, you can see the same effects at sunrise (if you get up that early). But during most of the day, when the full spectrum of colors is available, you see things more or less as they really are — in true and accurate color. This brings to mind an old philosophical conundrum closely related to Plato’s Cave. How does one know if what one sees is the truth? Modern science is quite good at explaining optical effects, but perception is a “whole ‘nuther thing.” What the human brain sees is intimately connected to the function of the eye. And what the eye sees depends on what kinds of light it absorbs and detects. If you could see infrared light (as snakes do) or ultraviolet light (as bees do), the world would look very different indeed. So when you consider all that, maybe the snow really was pink. At least for awhile. Much later that same night, I swear the snow looked black. Good Sky Lights, Dan, about our perception vs. the truth when it comes to color. Food for thought. And what about people who are color blind? I know several who are EXTREMELY color blind, almost to the point of seeing in black and white! So is everything they see a lie in terms of color? Yeah, I kinda waxed philosophical on this week’s Sky Lights. I mean, if our Sun were a red star, snow would always look pink (unless artificially illuminated). Makes you wonder what we really mean by “true color.” And you raise an excellent point about people with color blindness, or other vision defects. Of course, the reason our eyes see the colors they do, is because they evolved in the light of a yellow-white star. Makes me wonder what infrared and ultraviolet “look like” to those creatures who can perceive that type of light.